Supermarket group Coles has expanded its financial services offering to Australian consumers, with the launch of a new life insurance, with prices starting at $1.00 a week. Underwritten by one of the world’s largest insurers MetLife, Coles said this new product would evolve the Coles Insurance brand beyond that of car and home insurance. Coles said recent customer research found that over 50 per cent of Australians did not have life insurance because they believes it was too expensive. According to Coles, the research revealed many consumers believed the average insurance premium will cost around $1,500 per year, when the average cost of life insurance was actually less than half of this figure. Rob Scott, Coles Finance Director, said offering life insurance was a natural progression for the company. “Coles realises how important your life, your health and your family are and we want to help everyday Australians protect what is dear to them,” Mr Scott said. “We know that changes to life circumstances are a big driver in consumers making the decision to take out life insurance,” Mr Scott said. “It’s important for them to know Coles now offers protection, with a price beat guarantee, that is simple, easy to understand and easy to apply for,” he said. 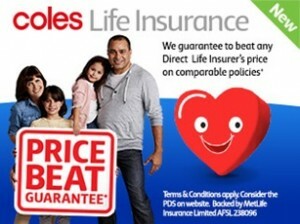 Coles said that when flybuys members combined Coles Credit Card and Insurance products – with the addition of Coles Life Insurance – they would have the opportunity to “save over $900 a year”. With two thirds of current policy-holders surveyed unsure about how much they’re covered for, Coles said the risk of underinsuring was “huge”. ABS statistics estimated the level of underinsurance of the lives of employed Australian families to be $800 billion. Mike Goodall, Chief Distribution Officer, MetLife Australia, said that while this figure was “staggering”, there was a clear disconnect between consumers recognising potential financial stress, and then acting to protect against it with life insurance. “As an industry, something we are working hard to convey to Australians is the fact that life insurance is something that doesn’t have to be complicated and time consuming, however you also don’t want to get it wrong,” Mr Goodall said. “As the new Coles Life Insurance cover shows, individuals can be covered for as little as $1.00 per week and the application process is so simple, it can take just minutes,” he said. Coles Insurance was launched in 2010, offering home and car insurance.